Every year, thousands of artists, musicians, photographers, tastemakers and professional wanderers, bound by the love of good music and great times, descend onto the desert in Indio, California to experience and document every awesome thing about Coachella. When it comes to style, Coachella is the epicenter of chill style. 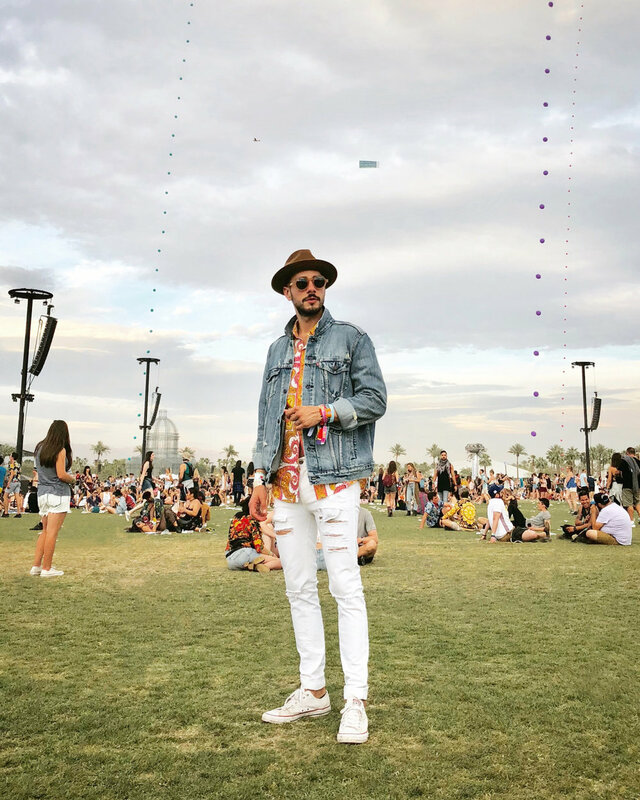 In today’s post I’m recapping all of my looks from Weekend 1 at Coachella 2018 in hopes that they serve you as inspiration for all of your festival looks this year. I kept things pretty easy and simple for day one. Having to drive from Los Angeles to Palm Springs meant comfort was key, so I paired a striped Hugh & Crye popover shirt, which had a pretty loose fit for maximum ventilation, with navy printed shorts from Uniqlo, a straw Panama hat from J.Crew and white Converse. My second look was all about these statement trousers from Mr Turk. The mid-century modern print was very fitting for Palm Springs and the trousers are unlined which gave them extra breathability and made them very comfortable to wear all day. I paired these trousers with a crisp and airy Mr Turk button down polo, black and white Old Skool Vans sneakers and to complete my nod to the simple cool styles of yesteryear, I topped it all off with a pair of brown Persol sunglasses and a Goorin Bros. fedora. A sensible pastel morning in pink jeans and powder blue shirt, both from Dr. Denim, paired with navy suede Soludos espadrilles, Ray-Ban sunglasses and a straw Panama hat from J.Crew. A nod to hippie fashion of the swinging sixties...because nothing represents peace and love so much as a flower. Click here for a flashback. I wore my Mr Turk floral shirt under a Levi’s trucker jacket (with a tie dye back), white distressed Dr. Denim jeans, Converse sneakers, round Komono sunglasses – “right on, man!” – and Goorin Bros. fedora. For my next look, I paired a sleeveless rock tee from Forever21 with olive slim tailored trousers from Dockers. You guys, these trousers are challenging everything I thought I knew about Dockers. They have a new line of khakis called Smart 360 Flex which has 4-way stretch (perfect pant to dance in), flexible waistband for extra comfort when you’re on-the-go, and hidden pockets to keep your stuff safe at the festival. They’re a total game changer–for real–and I wear mine all the time. I completed my look at the Republic Records party with white Converse sneakers, a couple of necklaces and yellow sunglasses designed by Gigi Hadid for Vogue Eyewear. And finally, the last day was all about piña coladas with my friends by the pool at the Ace so I kept my look easy breezy with an oversized Parthenis t-shirt, paisley shorts from Mr Turk, navy suede Soludos espadrilles and yellow sunglasses from Vogue Eyewear. And there you have it, a recap of my six looks from Coachella 2018. I hope these looks inspire some of your festival fashions this summer and if you have any questions about these looks or need help styling your festival outfits, remember that you can always ask me anything in the comment box below. Have fun and don’t forget to subscribe to my newsletter to get Reyal Fashion sent straight to your inbox.